Happy New Year from the team here at Nutrilicious! We thought that with the new year comes a great opportunity to take stock and consider what’s lined up for food, nutrition and public health in 2019. By far and away, the biggest thing in our diaries for 2019 will be Brexit and what will inevitably mark a fundamental change to the British food system as we’ve come to know it. Come 29 March, the deal will be done (or not!) and what that will look like is anybody’s guess right now. The UK does not feed itself. We rely heavily on other countries for our food supply, with only 49 per cent of the food consumed in the UK produced here and 30 per cent coming from the EU; the equivalent to 10,000 shipping containers each day. For some commodities such as fruits and vegetables, our dependence on imports is much higher, in this case, we import 90 per cent of the fruits and vegetables we consume. And so, because our food system is complexly intertwined with the EU, once we leave, it will significantly change our trading relationships, both with the EU, as well as those countries out of the EU that have trading agreements with it. Consequently, people’s diets will be most likely be affected, with a working paper from the Oxford Martin School on the Future of Food warning that food prices are likely to increase, particularly for fruit and vegetables. 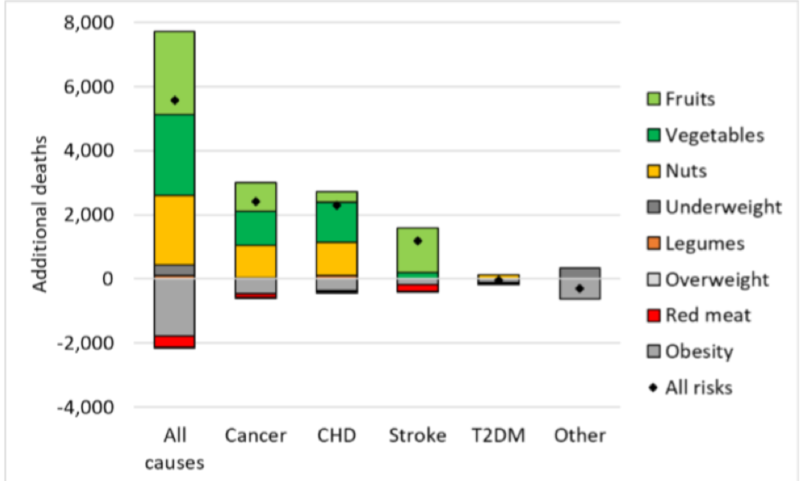 According to this modelling, a Hard Brexit (trading on World Trade Organisation terms which imposes tariffs on imports) could lead to 5,600 additional deaths per year, associated with reduced consumption of fruits, vegetables, and nuts. This will not only affect individuals but the wider costs to society are pegged at increased healthcare expenditure at around 600 million GBP. On a positive note, there may be small benefits on obesity rates and reduced red meat consumption (see Figure 1)! The current deal on the table, due to be voted on in mid-January aims to provide a continuous tariff-free and quota-free access to EU markets, but even if voted through, the road ahead is likely to be tumultuous. Initially, the EU Withdrawal Act writes EU law over into UK law ­– triggering some necessary changes in relation to country of origin labelling and address information. Further changes to our food and nutrition labelling and food regulations may be unavoidable if international trade deals require them. 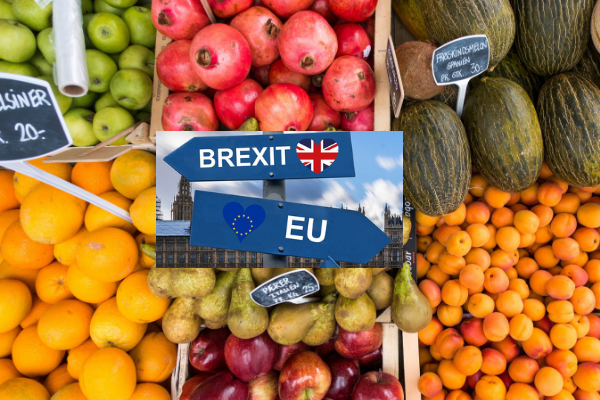 We should all be watching closely to how Brexit translates to the food on our table, dietary choices and ultimately public health. We’re expecting that the EAT-Lancet Commission report on Food, Planet, Health, due to launch on 17 January, is going to make waves. Never has the connection between food, planetary and human health been more apparent, with the need to address issues and impacts ever more pressing. What is a sustainable food system? What are the trends shaping diets today? Can we achieve healthy diets from sustainable food systems? How? What are the solutions and policies we can apply? The report will include the latest research on each of these workstreams and will be publishing targets that deliver for both people and the planet. If you want to understand more about sustainable diets and how these new targets apply to your business, or would like a scientific review completed on another hot topic, please get in touch on 020 8455 2126. It looks like the team at Public Health England have been busy. While the rest of us were enjoying our mince pies, they have been working hard behind the sciences and they have kicked off the new year with the launch of new Change4Life messaging, raising awareness of the fact that on average, children are consuming their childhood sugar requirements by 10-years old. But what else is on the agenda for the year ahead? With the updated Childhood Obesity Strategy published mid-2018 came promises of consultations on bans on pricing and positional promotions in retailers and a 9pm watershed for advertising of unhealthy food and drinks. Though we did see consultations conducted on the ban of sale of energy drinks to children and mandating calorie labelling in the out-of-home sector, some of the other consultations have not materialised yet, but they will be coming this year. North of the border, the Scottish government also just completed their consultation on restricting junk food promotions, so it will be interesting to see what emerges there. In 2018, SACN also consulted on their draft review of saturated fats, which recommended a continuation of previous COMA recommendations of 10% total calories. The final report is due at some point 2019 and is on the agenda for discussion at the next SACN meeting in March. With saturated fat such a hot topic and matter of debate, keep your eyes peeled for this one, as it will provide some much-needed clarity and authoritative recommendations. So, that’s a brief flavour of some of the key things coming up on 2019. As ever, there’s lots of things to keep us busy! Here at Nutrilicious we can help with your nutrition and health strategy, nutritional assessments of product portfolios, insights – views from the outside world of nutrition influencers and what they think of your offering – overall helping to put you on the front foot of your competition and upcoming government reformulation targets or standards. Or, perhaps you have key messages that you’d like to share with stakeholders through engaging new media such as interactive webinars and podcasts. To discuss your policy and communication requirements, you can reach us on 020 8455 2126. Best wishes for a healthy and happy 2019.